Advanced High Strength Steel (AHSS) is a new generation of steel grade that is stronger and highly flexible. This type of steel is being utilised by the automotive industry because of its lightweight, durable qualities. But because of its unique combination of material and mechanical properties, manufacturing this type of steel requires extreme precision and reliable technology [Steel Market Development Institute]. With this, many steel industries are looking at rugged panel PC in optimising the steel-making process. These ruggedised panel computers are made with industrial-grade components which are robust and can withstand extreme usage. However, there are specific requirements to meet when integrating panel PC for certain operations in steel production. As such, heavy machinery takes up large physical space. Therefore, a 12.1″ panel PC is ideal for these manufacturing plants. It is compact with optimum computing functions necessary for steel production operation. 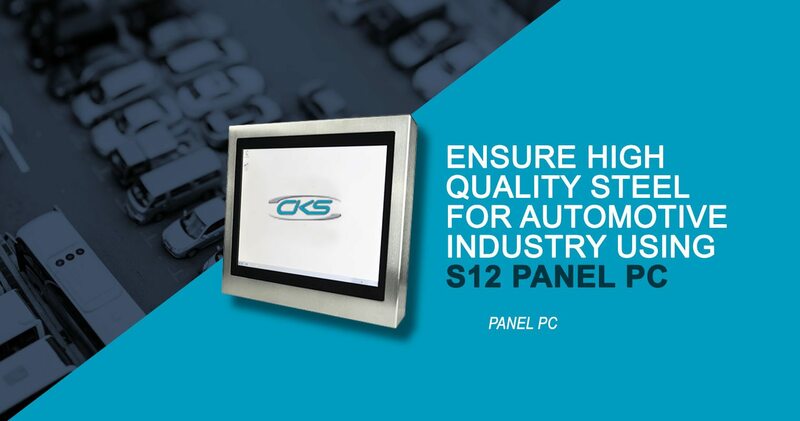 Learn about S12 panel computers in this blog and see how it can optimise steel-making processes for the automotive industry. The environment of a steel manufacturing has potential risks that can halt operations. Challenges include poor machinery maintenance, improper handling of hazardous materials, carelessness and even unrestricted access. As a result, there can be low productivity, revenue losses, and possible safety hazards. These risks can be mitigated by employing reliable and user-friendly compact panel computers. A 12.1-inch panel PC can be easily wall mounted and can fit in limited workspace spaces. It has a robust enclosure which allows it to withstand the harsh environment of the steel factory. Extreme heat, dust, dirt, scratches and shock damage are undeniably present in the steel manufacturing floor. And, deploying S12 industrial panel PC is a remarkable strategy. These high-grade compact devices can help prevent operations from stopping which will result in losses.It also has the key features needed for steel manufacturing. Take a look at some of its innumerable capabilities of 12.1″ touch panel PCs. Note that the steel manufacturing plant has an extreme environment where heat, dust, and other potential risks are visible. But, having an S12 ruggedised panel computer has the highest degree of protection rating for a device. It has the capability to withstand extreme heat, dust, dirt, shock, vibration and liquid damages. Thus, it can perform its functions efficiently despite these potential risks as the internal components are well-protected. A watchdog system is crucial for computing devices in a manufacturing operation. But, this computing device has a built-in watchdog timer, which is suitable for monitoring operating conditions. Thus, it can be connected to large machinery whilst protecting the device from software or hardware failures. Polycarbonate material is a durable type of plastic that is mainly used for products requiring impact resistance. Plus, a screen with this type of material has excellent clarity that is resistant to scratches. Hence, impact and shock will not easily damage a panel PC that is set up in the steel manufacturing floor. It is a paramount priority in the steel industry to ensure that operations are not hindered by faulty machinery. But, choosing an S12 industrial panel PC indubitably warrants an efficient steel-making procedure. Plus, it has the specifications needed for a streamlined operation. Contact an industrial computer manufacturer today and start integrating the 12.1” advanced PCs for a high-quality steel production.